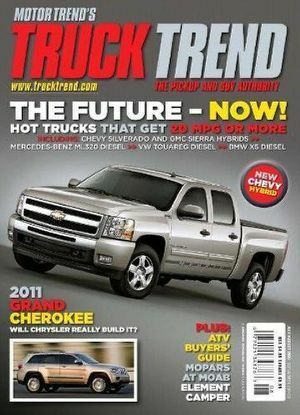 Truck Trend Magazine provides general interest truck buyers as well as enthusiasts with all the latest from bare-bones pickup trucks to luxury sport utilities. Truck Trend Magazine is the comprehensive magazine for owners and enthusiasts of pickup trucks, sport utility vehicles and vans. Each issue of TruckTrend Magazine includes articles covering all the latest from bare-bones pickup trucks to luxury sport utilities, single and multi-vehicle tests, road trips, reports on future designs and trends, and a look at the latest in personal accessories for work and play.